Fig. 1. Immunohistochemical localization of anoctamin 1 (ANO1) in the cerebellum. (A, B) Micrographs of a coronal section of the mouse cerebellum processed for immunohistochemistry with anti-ANO1. 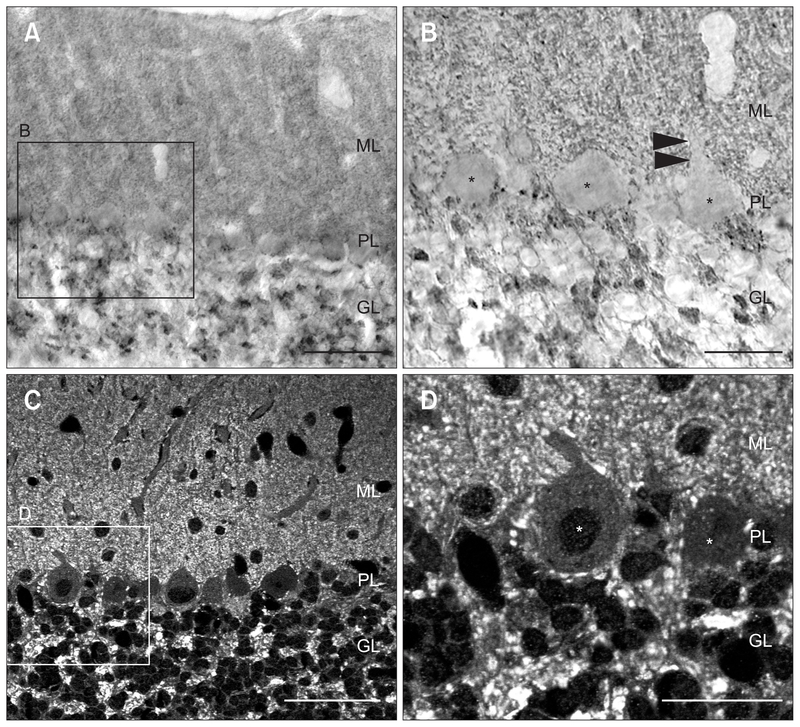 In , weak immunoreactivity in molecular layer (ML) and strong immunoreactivity in granule cell layer (GL) was observed in low magnification view of cerebellum. In , higher magnification view of the boxed area in . Bodies (asterisks) of the Purkinje cells in the Purkinje cell layer (PL) and a primary apical dendrite (arrowheads) of a Purkinje cell did not show ANO1 immunoreactivity. (C, D) Confocal micrographs of a cerebellar coronal section processed for immunofluorescence with anti-ANO1. As shown in , ANO1-labeled tiny puncta in the ML and larger puncta and patches in the GL are seen. Similar to , Purkinje cell somata (asterisks) in the PL and a primary apical dendrite (arrowheads) did not show ANO1 immunoreactivity. Scale bars=50 μm (A, C), 20 μm (B, D).